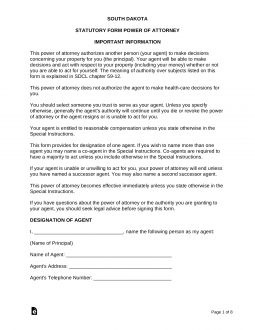 South Dakota Power of Attorney Forms can be considered a valuable legal mechanism for appointing another person to act in your stead and on your behalf. This process involves a legal document, typically notarized and witnessed whereby you set forth the name of the person you wish to appoint and the powers you wish them to have. You must determine how this agent should behave and in which areas he or she should be able to represent you. Such issues are addressed by selecting the form that best suits your needs. Because you are giving another person your power to act in certain situations (depending on which form that you choose), it is important to choose your representative wisely. Durable (Financial) Power of Attorney – This type of document is used to appoint another to handle your financial affairs. It is usually used for long-term planning in anticipation of possible incapacity, as it will continue to be effective beyond incapacity. General Power of Attorney – Similar to the durable form because it allows you to confer financial power on another, however, in the event you become incapacitated it terminates automatically. Limited Power of Attorney – Used when you wish to appoint another to handle a discreet or limited transaction. Medical Care Power of Attorney – For use when you wish to appoint a loved one to handle your medical care and arrangements in the event that you can no longer make the decisions for yourself. Minor Child Power of Attorney – Used when you want to give permission to a caretaker to take care of your minor child when you plan on being unavailable for a short period of time. Real Estate Power of Attorney – Select an individual to assist with the handling of real property relevant to refinancing, sales, and/or management. Revocation of Power of Attorney – For use when you want to terminate a power of attorney that you may have entered into in the past. Signing Requirements: No specific signing requirement; however, it is suggested that the document be notarized. Tax Power of Attorney (Form RV-071) – Used when you wish to appoint another to take care of your tax issues in front of the tax authority, such as to obtain information and make filings, etc. Vehicle Power of Attorney (Form MV-008) – Used to assign another to handle titling and registration of your vehicle.